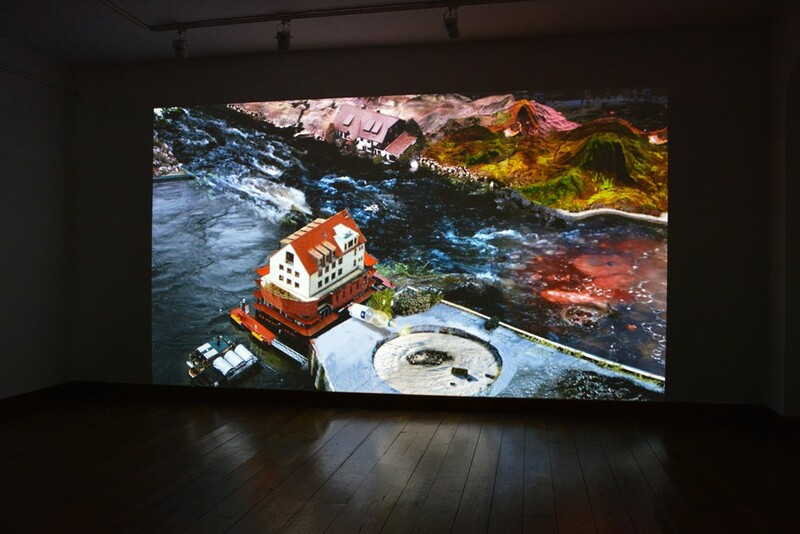 Westcoast is a panorama-video consisting of interwoven scenes mounted on a coastline – somewhere between Rotterdam and Sydney. 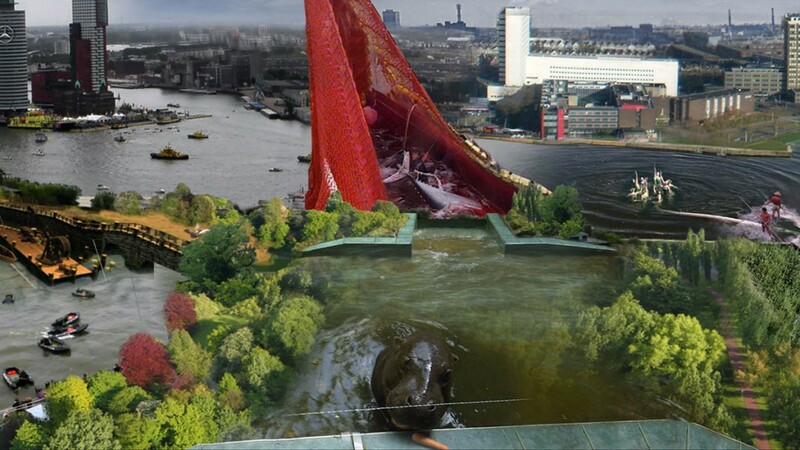 Starting from a bubbling primordial soup, the view incessantly pans along an waterfront in the style of a late transnational financial eclecticism and passes by mystical events, such as a giant hippo eating carrots and hectically spinning rubber boats. 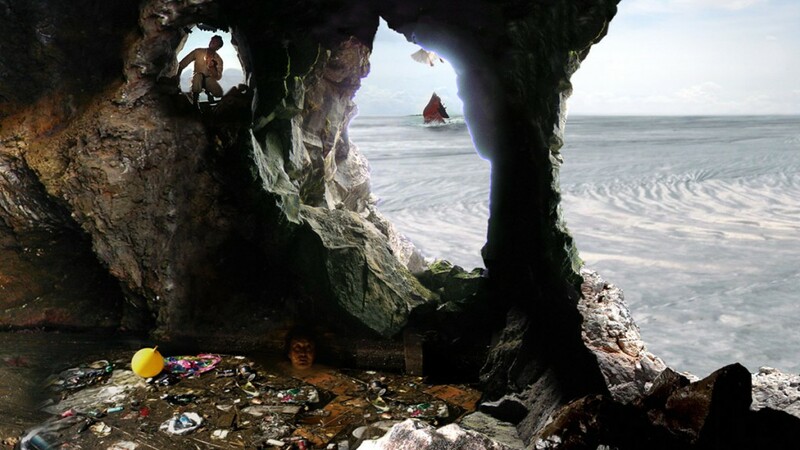 After a dark spiritual waterway recalling mideval atmospheres, the panorama ends in a cave encommpassing a refuse-Jacuzzi in which a white woman gazes about with melancholy. Is our Westcoast someone else’s Eastcoast? 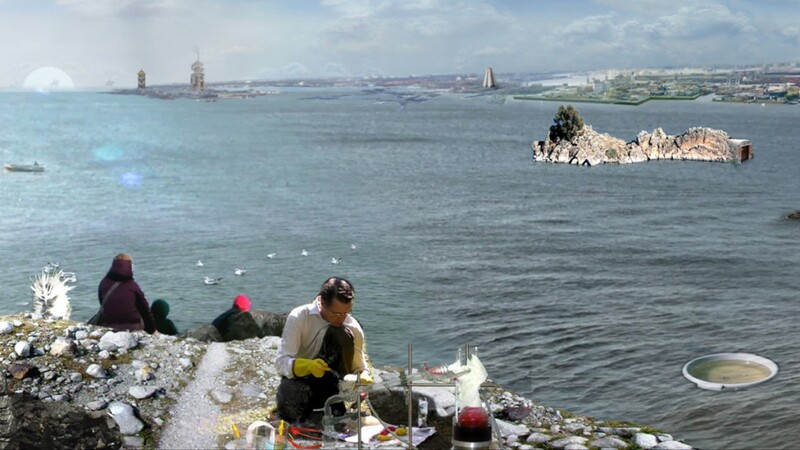 Ulu Braun’s video “Westcoast” (HD, 7:20 min, 2009) ‚“ is his second large scale digital work of this kind after “Southwest”. 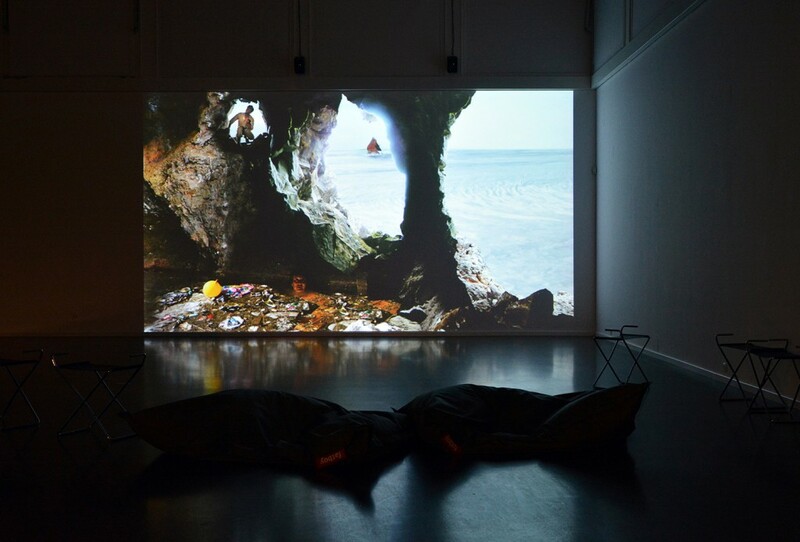 Somewhere between film, video, collage and animation, the camera moves along to the right, horizontally across a digitally mounted tableau which lends space to humans and animals for all kinds of circular activities. Starting from a bubbling primordial soup recalling Tarkovsky’s Solaris, a panorama shot follows a coastline which has been covered with buildings in the globalised style of a late transnational financial eclecticism. Ulu Braun leads us past a hooded figure that leans back on the wind which blows from behind, face hidden by the flapping bonnet, across stretches of water on which a hippo is being fed carrots and rubber boats spin hectically, all the way to a front on shot of coastal towns designed under the world bank’s supervision, somewhere between Sydney and San Francisco, in order to let tainted waters of the East slosh against oil-spilled coasts and end in cave complete with refuse-Jacuzzi in which a white woman gazes about herself melancholically. The basic ingredients of this work come from documentaries shot by the artist and video sequences from his extensive collection of recorded television material which have been selected, looped, sampled and mounted like a collage on a digital canvas. 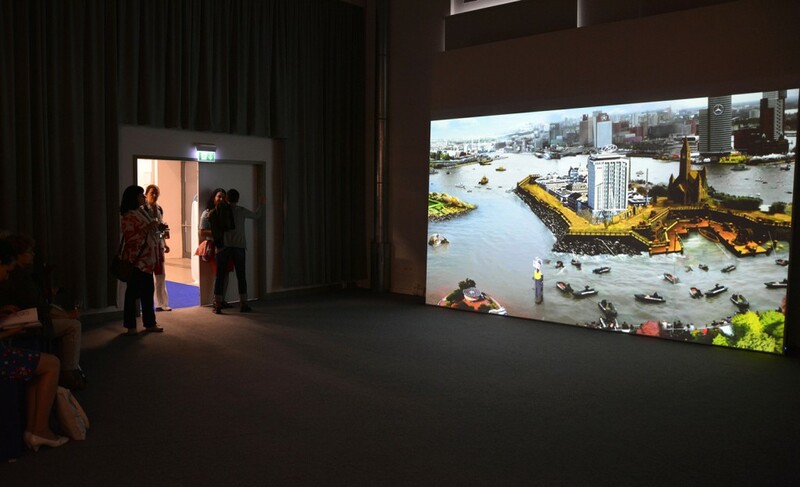 Ulu Braun’s technique of assembling short clips and film loops to a large scale tableau of consistent perspective, might be described as video clip-construction. The subjects that are chosen as well as the way in which they take shape trace the basic problems, formulated by Dadaism, of continuity, simultaneity, elasticity, synchronicity and synaesthetics. The step from collage to construction is not determined by the elements selected or by their synchronous arrangement: while simultaneity designates the rendition of spatially or temporally incongruous events within the same image ‚“ e.g. when in cubism the projection of multiple views of an object is rendered by faceted fractions on one plane ‚“, what is characteristic in this infinitely folded triptych is the circular, self-contained movement of the individual elements. This montage does not juxtapose linear, parallel events but the self-contained, reiterated, symptomatic gestures of a particular, typical action. The shot is by no means an element of montage. The shot is a montage cell. Just as cells in their division form a phenomenon of another order, the organism or embryo, so, on the other side of the dialectical leap from the shot, there is montage. By what, then, is montage characterised and, consequently, its cell ‚“ the shot? By collision. By the conflict of two pieces in opposition to each other. By conflict. By collision. The separation of the individual elements which is given here in Eisenstein’s radical verbalisation is cancelled out in Ulu Braun’s video work that seeks seen images: The contiguity of the individual shots becomes coexistence. Yet where do the images, once seen, end up, where are the thoughts and associations they inspire beached? Where do the small frames land, be they the 24×36 of celluloid cinema or the 1280×800 pixel of the computer screen? On the one hand, there is the sheer material: in 2001, 400 new cinema productions went into distribution. That equates to 10,800 tons of film ‚“ which has to be disposed. “1226 copies of Harry Potter and the Philosopher’s Stone hit the German cinemas. An audience of 5 million have already seen the story of the little sorcerer’s apprentice. After eight weeks the storm subsides. By that time, the first rolls come back to us,” says recycler Jürgen Vogt. “In Boffzen employees cut important passages from the films in order to render them unusable. 10,800 tons of waste are thus produced every year which later have to be shredded and turned into park benches and television casings.” (Gregor Dolak in Focus magazine, No. 50, 2001) Is it unrecycled plastic debris that sloshes within the cave at the end of the panorama shot here? Which forms is the person trying to make out from the shadows on the cave’s walls while being up to her neck in waste? Ulu Braun’s tableau does not provide answers to these questions. It is no activist video. Rather, it seems to be a tentative analogy to the social context of Duchamp and Co. that is in order here. After all, the circular activities of the individual video cells recall the “Nine Malic Moulds” (station-master, priest, delivery boy, gendarme, cavalryman, policeman, undertaker, servant, waiter’s assistant) which produce a grinding noise moving monotonously to and fro as part of the “Bachelor Apparatus” in the lower half of the Large Glass on a metal sleigh. While Duchamp’s splitting up of the view of the socio-cultural conditions of high modernism is fragmented from every perspective and brought onto a flat glass plane and transposed into a complex mechanism of sexual desire, “Westcoast” might be considered the conversion of this aspect into a horizontally extended, flat, uniform and undifferentiated non-hierarchical arrangement of small onanistic miniatures. Without raising the admonishing index finger of cultural pessimism, the fact of everyday availability of moving pictures is put before us for contemplation, certainly leaving open all accesses to the potential of this novelty and inviting the entire anarchy of the possible. Within the context of Ulu Braun’s œuvre “Westcoast” may be considered a consistent realisation of his premises, formulated in his Hybrid-Autorenfilm-Manifest 2006 (hybrid-film l’auteur-mainfest), which are defined by the unconditional requirement of a continuous questioning of production conditions, means and ends, the emancipatory interest of the viewer and one’s own position. His artistic practice crucially revolves around working in a collective, the application of traditional techniques in novels ways and the ceaseless striving to realise the idea of the derivé within the production process as well as the product. The search for different applications of his skills as well as those of others, for the oblique, constantly to be re-imagined methods of production is successful whenever the process becomes noticeable in the product.